Many of you know me as Stoob or just as the guy with big hair making wisecracks at CiviCon. I'm also a guy with years of experience teaching adults in a classroom before I trasitioned into "the web". I've done audio engineering, video production and have now worked as an independent CiviCRM consultant and trainer specializing in small nonprofit clients for nearly six years. During interactions with dozens of organizations in this time I've come to realize that, although CiviCRM is awesome, it is not a solution. CiviCRM is a tool. Capable people who understand how to use tools are the solution. These factors have recently converged and put me in a unique position to offer something that adds value to our entire community. I'm proud and excited to announce CiviTeacher.com! CiviTeacher organizes clear and concise videos into a portable and searchable CiviCRM learning library. While there are many training options, CiviTeacher aims to be an effective and cost-effective solution for visual, kinesthetic and auditory learners. These screencasts are not marketing videos, simplistic "click here" instructions, nor hours-long recycled recordings of live training. 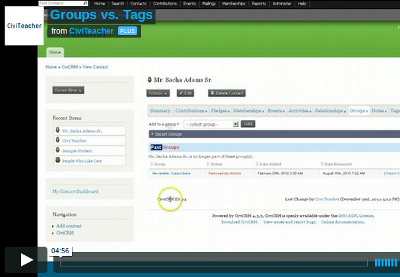 The CiviTeacher video library shows how to do real stuff in CiviCRM. I also offer viewers my knowledge and experience along the way: tips, tricks and best practices it would normally take years to acquire. Other open source projects have similar subscription-model tutorial services like BuildAModule.com and Drupalize.me that boast over 2000 subscribers. They're very slick and charge a pretty penny but I understand our community is different. Not only is CiviCRM's user base about 1% the size of Drupal's, but our budget-conscious nonprofit audience needs direct instruction on a huge variety of occasional, easily-forgotten tasks. I am a perfectionist engineer. However, I realize that placing priorities on fancy production and overly-polished scripts above breadth & depth of quality content both increases cost and decreases speed of delivery. With these factors in mind, I went to work and built CiviTeacher during the last few weeks. I'm adding new videos weekly. As I'm just getting started, CiviTeacher now has introductory subscription pricing. A monthly or yearly plan gains unlimited access to all the videos in the libarary. My goal is to add at least one new video a week through the end of this year. If you know me you then you know I don't mess around. Ultimately I envision a library exceeding 100 videos, spanning a variety of topics and experience levels. In case you were wondering, I built CiviTeacher with CiviCRM, among other things like Drupal and Vimeo. I looking forward to helping the community learn with CiviTeacher. Was curious to see how the new videos were going to be chosen? For instance, I have helped a few people with Open Layers and CiviCRM and the concept of circular references to make it work confuses many. I think that the videos I saw in the sample were very well put together but I worried that for those of us with more advanced training needs that the videos will be scoped to CiviCRM and not so much the CMS tie ins. I did see the one on webform integration listed but was curious for a bigger, long term picture. If you could lay out your plans for future videos beyond core Civi videos and perhaps what you will do when videos become outdated do to newer features being intro'ed say the ability to do a search without the need for group additions and subtractions, it would be greatly appreciated and probably for people like me get some money from my pocket to yours. Nice work thus far regardless. There is a video in the library called "Super Smart Groups" which covers the often-overlooked Include/Exclude search and the concept of building compounded groups - both Smart and regular. I have a suggestion form available to subscribers and value their input. At this point my content topics are based on the needs (as I see them through my consulting experience) of the typical small to mid-sized nonprofit user or administrator. I probably won't tailor many videos towards a developer, as this audience is small and their needs will be best met on IRC or the developer forums. Regarding Open Layers I have no direct experience with this and although I've worked with dozens of clients none of my clients use Open Layers, so this would not likely be a topic I cover for both reasons. I can't be everything to everyone. One more comment. I am a Drupalize.me subscriber and one of the things that I really liked about it was that when noobs were getting going that Drupalize.me created tracks/paths to follow. A sequence of videos that built on the previous video skillset. I might suggest that you look at doing that as well. I think sorting by level is great but that's not going to put them in an order that makes sense or better yet maybe follows the path of the CiviCRM documentation that people often start with (The Good Old Floss Manual). This is a good idea. When I have more content I will make a track like you describe.